One of the best ways to learn is through playing games, and that is particularly true when you are learning new words. 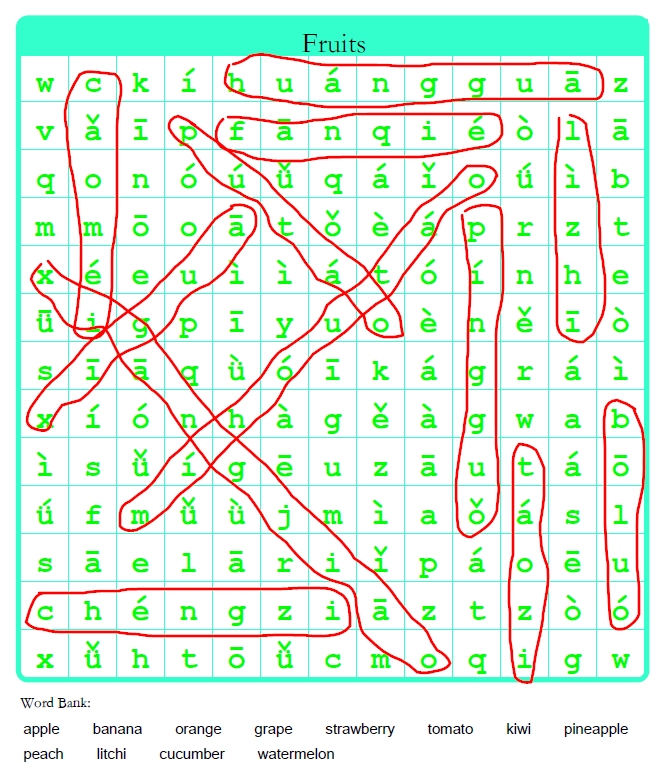 Many teachers use Word Search Puzzles as educational tools for children, the benefit being that young minds can learn new words and their spellings by intensively searching for them, letter by letter, in the puzzle.You can use this page to create Pinyin or Chinese word search puzzles for your classroom use with your own list of Pinyin or Chinese words. Both simplified and traditional Chinese characters are supported. You can click the P button to fill in Pinyin automatically. To make the search puzzles more challenging and fun, you can change the default settings to only show Pinyin or English in the word bank for Chinese word search puzzles. 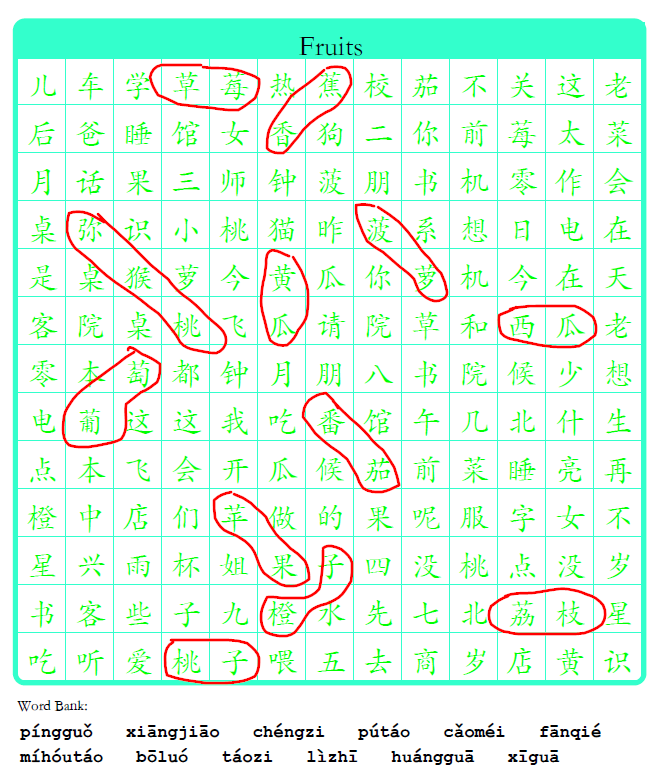 Likewise, you can make the word bank to list Chinese or English only for Pinyin search puzzles. 1. If the Chinese word list has more than 20 entries, only the first 20 entries will be used. The more entries you have, the more grids you need to use. Remove some entries or use shorter entries if the text becomes too small to read. 2. The grid and font size will be adjusted automatically. Sign in to show the vocab lists on my account. Load a list from your saved lists or find one by looking up the lists created by others. If the list has more than 20 entries, only the first 20 entries will be used to generate the puzzle. Remove the entries you do not need by clicking the trash can icon next to it. In the Puzzle Worksheet Options section, adjust the puzzle options as needed. Click the Print button to generate the puzzle sheets. If you want to create a new list, enter the title of the Chinese word list, such as My Family. The title is used to identify the word list when you save the list to the server. Enter Chinese character or word. You can copy or paste Chinese text from other sources, such as web pages or word documents, or enter them using your faovorite Chinese Input Method Editor(IME). Both simplified and traditional Chinese characters are supported. Click the P button to add Pinyin automatically. Note that Pinyin must be entered with tone numbers and its syllables must be separated by a blank space. As an example, for the Chinese phrase 哪儿, the Pinyin must be entered as na3 er2. Use v for ü, for example lv3 for lǚ, and number 5 for the neutral tone, e.g. ma5 (吗). Optionally, enter the definition of the Chinese character or word. You can click the E button to let the system fill in the definition for you if the Chinese is a single character or a commonly-used word. The Chinese word should not be more than 4 characters long. Click the Add Rows button to add more rows. Optionally, change the puzzle sheet settings, such as puzzle type, word hints in the word bank, etc. Optionally, click the Save button to save the word list for future use. Note that this site uses a pop-up window to display the generated printable. If your browser is configured to block pop-ups, you will need to allow this site to open pop-ups.